Home → Did you know? → Did you Know the other Pongals ? Maatu Pongal is celebrated on the second day of the Tamil month of Thai. The word “Maatu Pongal” in tamil denotes the festival celebrating cattle like cows and bullocks. This festival is celebrated as a tribute to the cattle that serve the farmers in providing dairy products, fertiliser and labour for ploughing and transportation. As part of Maatu Pongal celebrations, various sports displaying the dynamics and bravery of the Tamils are conducted. This includes the brave sport of Jallikkattu, a famous sport closely associated with the Tamil culture, which involves taming of the bull. Kanu Pidi is another ancient tradition followed by young girls and women in Tamil Nadu. 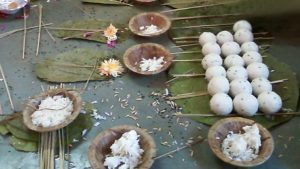 This occasion involves the feeding of birds by the women who pray the god for the well being of their maternal house, more specifically their brothers. Women prepare a “Kaka pidi, Kanu pidi” feast, placing a variety of coloured rice, banana and sweet pongal on the ginger or turmeric leaves for feeding the crows and other birds. Women also offer prayers in the hope that their sibling ties remain forever strong. As part of the Maatu Pongal celebrations, people bathe and decorate their cattle with colourful bells and garlands. Cows are bathed with manjalthanni (turmeric water) which also works as an important antiseptic. The holy kumkum is applied to their foreheads, and their sharp horns are painted with colours. The cattle are fed with a mixture of venn pongal, jaggery, honey, banana and other fruits. In the evening, people pray to Lord Ganesh. The also perform the ritual of sacred aarthi to their cattle, which is believed to remove all the evil influences over their cattle. Kaanum Pongal is the fourth day of the festival which marks the end of Pongal celebrations. The Tamil word ‘kaanum’ literally means “to visit.” This day is meant for relative visits and family reunion. Brothers pay special tribute to their married sisters by offering them gifts as an affirmation of their love and affection towards them. Landlords present their servants and maids with clothes and money as gifts. People living in the villages visit the houses of their relatives and friends while others make a visit to the temples and fairs. People living in cities flock public places such as the beaches and theme parks, along with their families. Sugar cane is an important crop associated with Pongal. People chew sugarcane on that day reflecting their happy and sweet mood. Many decorate their houses with colourful Rangolis or kolam. The Pongal festival is known by the name Sankaranti in Andra Pradesh and Telegana. Sankaranti is the major harvest festival of these two states. Mukkanuma is the final day of Sankranthi festival, which involves worshiping of the cattle. 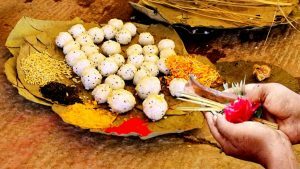 Mukkanuma is more famous among the non-vegetarians who avoid intaking non-vegetarian dishes during the first three days of Sankaranti, saving them for the fourth day of Mukkanuma.